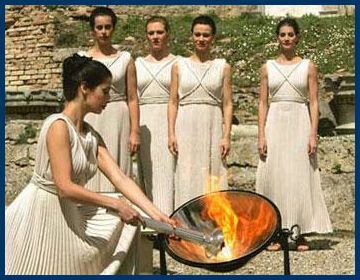 The Olympic flame is a symbol of sustainability of the Olympic idea. For the first time it was flashed during the Games IX Olympiad in Amsterdam, but it was done without any accompanying celebration. Only since the Berlin Olympics in 1936, has it been an established custom of carrying the fire by relay runners from ancient Athens to Olympia to the next Olympic city. In Olympia, the fire is lit, from the sun, which takes place in the ruins of the temple of Hera with a concave mirror. racing to the altar during ancient holidays. Their winner gained the right to fire the fire in honor of the Games' deity patronage. The most important marathon occurred in Athens in honor of the goddess Athena. Five teams of forty people participated in this prestigious race. A team won and received the team prize that first passed the torch to the priests on the steps of the Prometheus Altar. Outside of Athens held similar cross-country marathons, depending on the size of the city and the local traditions, with the participation of 48, 40 or 10 athletes. With the marathons, horse racing was also a popular sport, having its history deeply rooted in ancient Olympia, yet the torches were not lit then. However, the modern Olympic torch, or rather, three candles were lit for the first time in Stockholm in 1912. The idea came of a torch being lit from sunlight and transferred by relay were two scientists: Greek Loannis Ketseas and German Carl Diem. Many cities have sought to take the Olympic tradition, the torch, and put their own creative spin on it. For example in Montreal, to emphasize the equality of the sexes, three people carried the Olympic Torch, a couple, a boy and a girl. In Barcelona, the flame was carried by Antonio Rebolo, a longshoreman disabled in a wheelchair, who fired a flaming arrow from a bow, so that went to the Olympic bowl. During the Winter Olympics, The Olympic Torch was lit, for the first time, in 1952 in Oslo. Norwegians believed that their country was the homeland of the Olympic Winter Games. In 1998, in Nagano Japan, the torch was lit by Briton Chris Moon, a member of the international peacekeeping mission, who lost his right arm and leg during the disarming of mines in Mozambique. Moon ran into the stadium surrounded by children who, earlier, he was protecting in Mozambique.